Drama/Crime, Italy, 1948, 93 min. 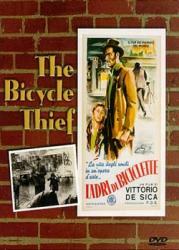 Synopsis A poor young father in postwar-ravaged Rome who finally finds work putting up Rita Hayworth posters around town, only have his precious bicycle stolen the first day on the job. In a light moment as the father and his young son chase after the thief, the boy attempts to relieve himself against a wall, and his father lets him know they don't have time for that. In another scene, the father tracks the thief into the kitchen of a brothel.